The big event in Parliament Square on 28 October went as planned, with the highly-disciplined crowd keeping its anger under strict control, and the Royal Marines, as ever, setting a fine example. But the publicity last year’s event created was not repeated, only the Daily Mail and Daily Express giving the campaign the strong editorial support it must have if this type of extra-parliamentary publicity is to influence the MoD. Those who expected the Rt Hon Sir Michael Fallon, Secretary of State for Defence, to attend, were disappointed. Perhaps his Special Advisers have failed to brief him on the importance of Morale in the Armed Forces. We have published a book, The Betrayal of Sergeant Blackman, RM (now available from Amazon) which includes a foreword by Heraclitus (author of the foreword in Bullingdon Defences, the first book we published). As it fairly summarises the perversion of the justice imposed on Sergeant Blackman it is reproduced here in the expectation that readers will encourage all their friends to study it, and thus to understand fully the enormity of what ‘The System’ has done to Sergeant Blackman, his family, his friends, the Royal Marines, and to the Morale of the Armed Forces. One of the world’s most powerful Armed Forces, funded by one of the world’s richest economies, exploiting the latest war technologies and directed by highly-educated politicians, having been defeated successively in Basra by a mob of street Arabs, and then in Helmand by uneducated, impoverished, and ill-armed tribesmen, has fallen victim to institutionalised post-traumatic stress disorder (PTSD) and savage self-mutilation. Among those made to suffer most from this psychopathic response have been a loyal Royal Marine and his family: Sergeant Alexander Blackman, RM, is currently still serving the ten-year gaol sentence – reduced on appeal to eight years – that was passed at a flawed Court Martial in which his defence team failed to produce crucial and readily available evidence, and the Judge Advocate General (JAG) betrayed unprecedentedly vile prejudice. This book describes the cruel stress imposed on those who, like Sergeant Blackman, led foot patrols in Helmand with inadequate weaponry, unreliable equipment, insufficient sleep, very little rest, questionable doctrine, an uncaring command chain, and, almost as an icon for all that was wrong in Helmand, no reliable air support – especially none of the ‘Buddy Cover’ supplied to infantry patrols in our previous COIN wars by small light aircraft such as those built by Auster and Piper specifically for such tasks. The JAG’s Sentencing Remarks, when examined in Chapter Three, clearly expose their extraordinary prejudice, especially in respect of their failure to take account of the relentless stress under which Sergeant Blackman had to operate. They here reveal the JAG’s rejection of psychiatric evidence, his omission of the crucial explanation of the relevance of the Lesser Included Case to the Board of Officers, and his failure to ensure that all the witnesses supporting the defence of Sergeant Blackman were called. Damning evidence of the ‘stitch-up’ conspiracy is in the refusal to allow the testimony of Colonel Oliver Lee, RM, and of Warrant Officer Stephen Moran, RM, both of whom had sought to give witness, in effect key expert witness, in Sergeant Blackman’s favour, principally in respect of the acute and overwhelming effects of accumulated stress. Colonel Lee’s objection to this shameful miscarriage of justice prompted him to resign his commission, an extraordinary measure for a career officer, one that alone ought to have rung ear-piercing alarm bells in Whitehall and Westminster. This book emphasises the important point that the widespread belief among servicemen and women that the case against Sergeant Blackman was a ‘stitch-up’ has damaged Morale throughout the Armed Forces at a time when Morale is at its lowest-ever recorded level. This situation alone demands that immediate restitution of liberty and generous compensation be made to Sergeant Blackman, even before a retrial and the formal Not Guilty verdict that was always his due. The Morale problem must now be tackled without reservation, lest the betrayal of this Royal Marine become a permanent and shameful totem representing, to potential recruits and to potential enemies, life in today’s British Armed Forces. Morale, Napoleon believed, is to the materiel as three to one, and there is much in the long history of the British Army to support this assessment. For that reason this book reproduces in Chapter Five a paper submitted to the committee preparing the 2015 Strategic Defence and Security Review recommending the most serious and immediate attention be given to investment in the virtuous triad of Morale, Competence, and Honesty, all of which, and especially Morale, were failing, as they are still. As will become evident to the reader as these pages turn, the rapid deterior­a­tion in Morale during the last twenty years can be attributed directly, not just to ‘The System’ as has been the traditional verdict (expressed silently with shrugged shoulders,), but to a specific fault in Whitehall’s incestuous relationship with the Senior Civil Service, a fault that has fostered, among other sins, a deliberate disregard for the welfare of those in uniform. Among the more serious examples of this calculated neglect has been the treatment of Sergeant Blackman, RM, and his family. His Court Martial was not just a miscarriage of justice: it was a perversion of justice. But that is only part of the story: the Blackman case, because its injustice is so obvious, has caught the attention of the public as has no other since Admiral Byng was shot (with the intention of encouraging other officers to sacrifice themselves in the service of the Admiralty), and has thereby become an icon representing the many other examples of the MoD’s dereliction of duty and uncaring destruction of Morale. This book demonstrates that this perversion was not an accident, that it was consciously deliberate, and it describes relevant aspects of that ‘System’ which seeks to give cover to the moral sickness allowing such perversion. 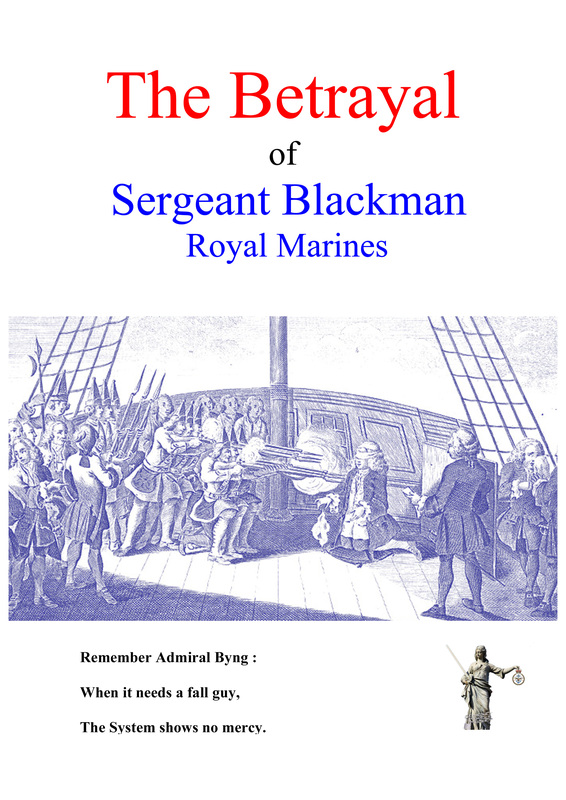 Obviously, it is primarily an explanation of how and why Sergeant Blackman was betrayed, and how and why his character was so heinously traduced, but it has a secondary purpose in describing to the public how the Morale of the Armed Forces is being destroyed, not by giving a series of anecdotes (poor food, slum accommodation, unserviceable equipment, penny-pinching logistics, early redundancy reducing pensions, etc, all of which the national newspapers can cover), but by adopting the Sergeant Blackman betrayal as an avatar for the despair recognised, by those who serve and have served, to be a real and present danger to national defence. Available from Amazon. Spread the word.